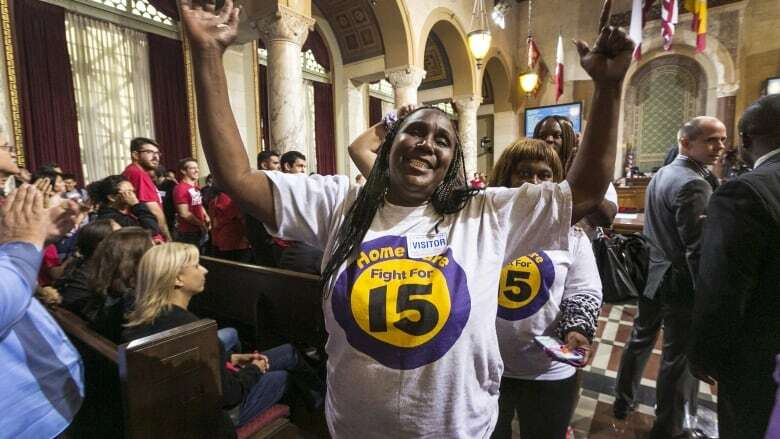 Officials have given final approval to an ordinance that makes Los Angeles the largest city in the U.S. to gradually raise the minimum wage to $15 an hour. The City Council voted 12-1 in favour of the increase Wednesday and forwarded it to Mayor Eric Garcetti. His office says he plans to sign it Saturday. The wage hike received lopsided majority votes from the council last week and in May despite complaints from the business community. The ordinance boosts the wage to $10.50 in July 2016, followed by annual increases to $12, $13.25, $14.25 and $15. Small businesses and certain nonprofits get an extra year to phase in the increases. Seattle and San Francisco also have passed laws that gradually raise the hourly minimum wage to $15. Large cities are becoming of aware of a conundrum. They need many service sector workers, who usually make minimum wage, to wait tables, pour coffee and sell clothing within their borders, yet housing is so expensive that most minimum wage workers can no longer afford to live close to where they work.